Doers expect their leaders to form teams and to act in a team-like fashion. If they do not see teamwork modeled from above, there is no inspiration for them to make the necessary compromises to work with their peers cooperatively. Organizations without teamwork at the upper levels develop a reputation for dissent, not cooperation. 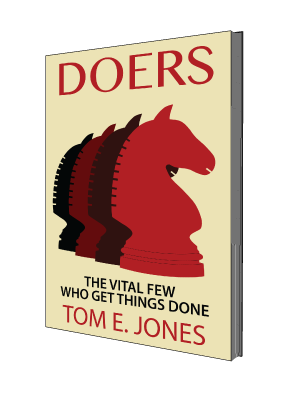 Doers feel disconnected and vulnerable, especially during times of change, because they can have no collective sense of accomplishment. In addition, it is hard for Doers to measure their own growth because they feel as if they are operating in a vacuum. A high performer cannot have a clean sense of accomplishment if she is the only one measuring what she produces. She needs feedback from above to perceive how she is really doing. Leaders should be continuously providing evaluations and honest feedback, while simultaneously addressing poor performance and inappropriate behavior in a timely way. Evaluations contribute to the overall morale of the workforce; the immediate feedback clears up confusion, reinforces excellence, and helps reassure people that their growth within the company is on track. When hard work is recognized, it provides the Doers with the incentive to reach for even loftier goals. This is especially important for the type of high achievers companies want to attract. Addressing poor performance is also important because it raises the overall performance levels and reassures high achievers that the company’s status as a place that rewards excellence and discourages substandard work is deserved. Leaders should be encouraged to field complaints, accept criticism, challenge inconsistencies, and communicate negative information without prejudice. This establishes your company as a place where open communication is the norm. Doers want assurances that they will, in fact, be supported for trying to rectify problems, not penalized for it, that honesty counts, and that they do not have to suffer the frustration of hiding the truth. To excel, Doers must trust that their own mistake can be aired and corrected without fear that it will be constantly held against them and hamper their career path. The learning organization, which every modern organization needs to become, supports experimentation and in turn, attracts creative thinkers who value and support teamwork. In the end, the only thing that is measured or remembered is success.